After having ridden almost all of my life and experienced many equine disciplines, I am daily reminded of how much I love the sport of dressage. It is mainly an English discipline using an English saddle and a snaffle bit. It may be studied using any type of riding horse, as it will improve their mind, physique, and gaits when properly practiced. It may be ridden in any fairly flat area but may be done on the trail, at the beach, and even on a slightly sloped area. The main criteria is that the footing is safe, meaning not too hard, nor too soft, and without rocks or holes. Ideally however, a flat area of about 20×40-60 meters with a perimeter of at least poles on the ground to help delineate straight lines and corners. The sport of dressage involves a systematic method of training a horse so that physically, mentally and emotionally the horse is gradually taught to execute exercises and patterns, which over time, improve the balance, strength, focus and agility of the horse. It may be compared to exposing a child to the education system starting with preschool and ending with grad school. To be effective, clear and quick with the timing of the aids or signals, a person must physically develop into an athlete, becoming supple and strong. Mentally a person must learn the basic exercises and understand how the aids or signals for these patterns and movements must be delivered. And emotionally, a person must learn to gain control over their attitude and desires so that calmness and patience surround their behavior and requests for the horse. I am personally blessed to be a wife, mom and grandma and still be able to fully participate in this wonderful sport professionally, competitively, and for my pleasure. I am constantly learning and improving, as I get coaching from some of the best coaches in the world. I get to share this awesome sport with clients who also have a passion to learn to ride better and grow with their horse in this wonderful discipline. I daily witness people, young and older, reach their goals and beyond with their horses. Experiencing their joy and conquests over their challenges is so inspiring! And I must add that this sport builds character and commitment which facilitates persistence during the setbacks that life always seems to offer. Dressage itself has been practiced for centuries. 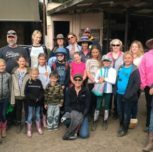 The California Dressage Society was founded in 1967 to “foster interest among horsemen in dressage and was designed to offer an educational framework in which an individual can progress with the schooling of themselves and their horses.” Our local chapter has also been dedicated to this cause for over forty years. Interest in this sport is growing among the many breeds of horses. There are almost sixty recognized breeds competing for All-Breeds Awards with the National United States Dressage Federation. So those of us committed to the sport invite all of you who haven’t yet caught the bug to seek us out! We’d love nothing more than to share dressage with you!